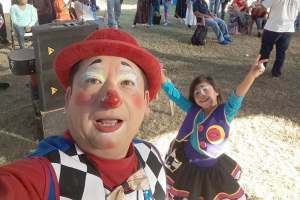 Clowning around for God - and ministering to migrant workers' children. This page is not currently available in ଓଡ଼ିଆ. If you would like to help translate this site please click here. Each winter volunteers from USA and Mexican churches join together for gospel recording distribution in the migrant farming camps of Culiacan, Mexico. During the time in January and February, several thousand recordings are given out in over 100 languages and several thousand decisions for Christ are registered annually in these camps. Yesterday I could not speak to any child. The agricultural field we went to denied us entry. We advanced a couple of kilometres and found a field called San Pancho. In the ministry of clowns we were ready, but that camp was only men - but I understood that God had a purpose there. So with the best attitude, I walked among a strong smell of Marijuana. Many were surprised to see a clown standing in front of the curtain that serves as a door. We found mostly speakers of Náhuatl, Huasteros of San Luis Potosí, and some Parne. A man named Anacleto asked me for a movie. I told him that perhaps at the main table where the film of the night would be projected. Later, I found him there standing, waiting. 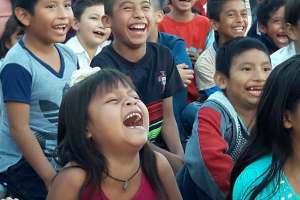 He approached me and said in his broken Spanish; "A year ago you preached to me in the field a few miles away (and surely it was not me, but someone else on the team), that day I prayed and I asked Christ to change me. I believed everything and you know what? Since that day, I stopped getting drunk, something happened to me. Two months later I returned to my town, with family. No more fights at my house with my wife and children. I have a land plot. In my town, we grow coffee. Everyone is dedicated to that, but something happened this year - nobody had a crop, but I had more than 40 bags of coffee! The men of the town came to see me to find out the reason why only my plot flourished. They asked me who gave the manure and the fertiliser. I told them it was God's rain. Brother, I do not know how far you've come, I do not know how much you spent to come here to tell us about Jesus, but I'll tell you something. Everything you spent is already paid for with my life. I'm saved, so is my family and my fields are prosperous. Tell your brothers, thanks for coming to the Culiacan fields that they continue to preach and not get tired. While yesterday I did not speak to a single child, God spoke to me. The gospel is not only good news, the gospel is transformational.